Christopher Hitchens, no stranger to contrarian positions, once wrote a remarkable polemic called ‘The Trial of Henry Kissinger’ impugning Kissinger for being as guilty as any common war criminal of crimes against humanity. In evidence Hitchens proffered his inculpation in the murder of democratically-elected Chilean president Salvador Allende. After General Pinochet assumed power Kissinger told Richard Nixon that the US “didn’t do it”, but “we helped them…created the conditions as great as possible”. Hitchens also marshalled in evidence Kissinger’s sponsoring of the carpet-bombing of Cambodia, and his and Gerald Ford’s oblique tolerance, and perhaps approval, of genocide in Indonesia. At the time the book had an incendiary effect but the allegations were not immediately directed into concrete legal action. Ultimately of course Kissinger had to leave France with unseemly haste with an arrest warrant pending and return to the safe refuge of the US where he thrives as a nonagenarian staple of talk shows, the idol of Fox News and a totemic visionary of Realpolitik. Such is the shadow existence of a once lethal global potentate. But Kissinger is old news, disempowered, with the historic crimes fading over time and mercifully, absent a call from Trump, out of harm’s way. Though you never know, such is the plausibility in our unethical world of the king of statecraft. Realpolitik has moved on from such crude seventies tactics as murdering a head of state to simply disemboweling him metaphorically – as with Tsipras – with the panoply of capitalism. Moreover we have, some of us, moved on to business-craft. From the modernist, almost industrial complex of building that is UCD stands out a splendid new addition, the Sutherland school of law, a sleek new premises which “incorporates teaching and learning facilities which are purpose built to foster and support more experiential styles of learning”. This is most apparent in the Clinical Legal Education Centre which incorporates a trial room suitable for mock trials, though not of its benefactors of course. If Peter Sutherland were a building it would be this building for, though well-upholstered, it’s a little top-heavy. Why do we never name schools of law after true heroes, or at least flawed ones? The Mansfield School of law, The Sean McBride or Mary Robinson School of law? Of course international businessmen and plutocrats of all sort seek, in the dusk of lives dedicated to the pursuit of money, to have their reputations magnified for future generations. Tony O’ Reilly, by far the most elegant of the Irish philanthropists, has his sponsored buildings in Trinity and UCD, named – perhaps – after his parents. But these things are done better and with fewer strings in the US, where the culture and indeed the tax regime are more conducive: Warren Buffett and Bill Gates are charitable icons and are scrupulously divesting themselves of their assets in the common good; many US universities depend on philanthropy. Naturally the Sutherland school seems a bit more business- friendly than its fuddy-duddy anonymous predecessor: it aims to make “our teaching and learning challenging, rewarding, relevant, and critical in engaging with the challenges of law in Irish and international business, social, political and economic life”. If Goldman Sachs did law faculties it might probably do this one. It is not clear whether the minions and opinion-formers, rushing to their lectures, have been encouraged to downgrade human rights, the environment and culture as part of the process of embracing their exciting challenges. Peter Sutherland is a unique case; a pasha of world fuzzy democracy, a knight of the British realm described in the Financial Times in 2009 as “at the centre of the establishment in all its forms”, a querulous and basilisk Buddha, looking down from a great height at the mortals of the world and their fig-leaves of democracy and national sovereignty, barriers to the elevation of trade that his career has so eminently promoted. But let us construct a narrative for this man. Gonzaga, UCD and King’s Inns educated and aggressively-rugby-playing, he became Attorney General of Ireland in his 30s, after a brief and unsuccessful electoral dalliance with Fine Gael; and then was made the youngest ever EU commissioner – for Competition, in which capacity he was famously dynamic, driving competition in the airline, telecoms and energy sectors, and attracting the admiration of federalist Commission President, Jacques Delors. He chaired the Committee that produced The Sutherland Report on the completion of the Internal Market of the EEC. Only Ireland’s dreary civil-war politics deprived Sutherland of the job he coveted most when, back in 1994, the UK recommended him for the post of European Commission president. His strings to Fine Gael meant he did not enjoy the support of his own country’s government, then led by petfood Taoiseach Albert Reynolds. Tellingly, he once told the Financial Times: “I do absolutely believe in the European project. I think it’s the most noble political ideal in European history in a thousand years”. The Competition Commissionership was the first step in his championing of globalisation, internationalisation, sovereign fluidity, and the promotion of economic liberalisation. Of course Sutherland can surely speak the language of progress and ethics – and he is even, as a Good Catholic, an economic advisor to the Vatican, Consultor of the Extraordinary Section of the Administration of the Patrimony of the Apostolic See (and President of the International Catholic Migration Commission). Nevertheless his work – and even his lifestyle – bespeaks slavery to the amoral deities of capital, profligacy and greed. Globetrotting private jets, secret meetings in the Vatican or with the Bilderberg Group, carefully regulated and deliberately evasive public appearances: bread and butter for decades for this warrior for the business agenda. It is of course an ambivalent existence – grey: not a matter black and white. He is an agent of liberalisations the upshot of which he feels no obligation to take responsibility for. 1. That he, Peter Sutherland, has committed Economicide. 2. That he, Peter Sutherland, has been implicated in Ecocide. 3. 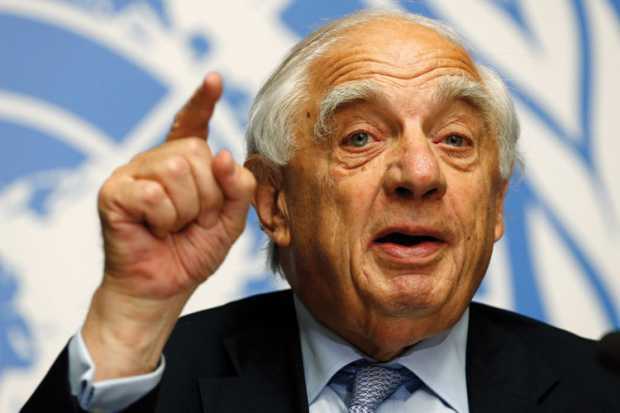 That he, Peter Sutherland, has, through his involvement with BP, been implicated in Human Rights abuses. These purely moral offences may have been committed through negligence or recklessness as well as intentionally. By his centrality to GATT and the WTO and his championing of economic liberalism he has intentionally or recklessly contributed unethically not just to enrichment of the few but to inequality, to the destruction of the quality of life in many countries as well as to mass evictions and homelessness. In 1993, Peter Sutherland became Director General of the General Agreement on Tariffs and Trade (GATT, commenced in 1948). Sutherland cites his work at GATT and the introduction of the Erasmus student exchange programme when he briefly held the education portfolio at the Commission in 1986, as his two most rewarding achievements. The Uruguay round of global trade talks, concluded in December 1993 with Sutherland as chair of GATT, produced a “comprehensive, rules-based and global trade regime” which was the biggest trade agreement in history and established the World Trade Organisation. His integral role in the successful conclusion of these negotiations has been cited by then US Trade Secretary, Mickey Cantor, as “indispensable”. A hagiographic 2013 book by Craig Van Grasstek of Harvard’s Kennedy School, ‘The History and Future of the World Trade Organisation’, published by the WTO, details Sutherland’s role in the formation and establishment of the body. Apparently, chairing the crucial Uruguay Round, Sutherland “employed tactics the likes of which had never been seen before in GATT…he worked to create the sense of unstoppable momentum” by mobilising the press and media and instigating “a more aggressive public relations than the staid GATT had ever before seen”. (Such stories abound. Contemporaries apparently remember the young Competition Commissioner too as someone who was “happy to go through you for a short cut” in his crusade to liberalise competition restrictions.) Sutherland was always an alpha-plus for capitalism. The World Trade Organisation (WTO) replaced GATT from 1 January 1995. The WTO deals with regulation of trade between participating countries by providing a framework for negotiating trade agreements and a dispute resolution process aimed at enforcing participants’ adherence. The WTO has a more solid legal basis than its predecessor and embraces trade in services and intellectual property. Mickey Kantor, the US Trade Minister, credited Sutherland with being the father of globalisation and said that without him there would have been no WTO. Certainly Sutherland’s involvement in GATT and the WTO have been instrumental in global economic liberalisation, removing the tariffs which protect local economies and the associated societies and cultures, the enforcing of intellectual property rights by developed countries to the detriment of local workers, and of course a crude internationalisation of culture. “WTO rules put the ‘rights’ of corporations to profit over human and labor rights. The WTO encourages a ‘race to the bottom’ in wages by pitting workers against each other rather than promoting internationally recognised labour standards. The WTO has ruled that it is illegal for a government to ban a product based on the manner in which it is produced, such as with child labour. It has mandated that governments cannot take into account ‘non commercial values’ such as human rights or the conduct of companies that do business with despots, as in Burma, when making purchasing decisions”. • The Agreement on Trade-Related Aspects of Intellectual Property Rights (TRIPs) agreement, which prevents developing countries from availing of some of the technologies that originate from abroad (including medicines and agricultural products) in their local systems. “During the colonial period, the gap between the richest countries and the poorest countries widened from 3:1 to 35:1, in part because European powers extracted so much wealth from the Global South in the form of resources and labour. Since then, that gap has grown to almost 80:1. The gap is growing in part because of the neoliberal economic policies that international institutions like the World Bank, the International Monetary Fund (IMF) and the World Trade Organization (WTO) have imposed on developing countries over the past few decades. These policies are designed to forcibly liberalise markets, prying them open in order to give multinational corporations unprecedented access to cheap land, resources and labour. But at a serious cost: poor countries have lost around $500bn per year in GDP as a consequence of these policies, according to economist Robert Pollin of the University of Massachusetts. As a result we see a clear net flow of wealth from poor places to rich places. Few people know about this constant siphoning of wealth. One reason for this is that the discourse of aid takes up so much space”. Sutherland’s speciality is the capitalist reunion/ thinktank. He served on the steering committee of the Bilderberg Group, until May 2014. The Bilderberg Group’s theme is to “bolster a consensus around free market Western capitalism and its interests around the globe”, according to Andrew Kakabadse. Bilderberg never releases its discussions but its agenda is wide-ranging across politics, security and economics. In 2015, as usual, it did not address the environment in any of its sessions. The influential Breitbart website calls this “stupid”. But the importance of the Bilderberg meeting is emphasised by the Guardian, which argues it’s more influential than the G7 meeting of leading economies. “Essentially liberal internationalists from Europe, Japan and the United States, the liberal wing of the intellectual elite. That’s where Jimmy Carter’s whole government came from. […] [The Trilateral Commission] was concerned with trying to induce what they called ‘more moderation in democracy’—turn people back to passivity and obedience so they don’t put so many constraints on state power and so on. In particular they were worried about young people”. Sutherland was vice chairman (2006–2009 of the European Round Table of Industrialists [ERT] which advocates policies at both national and European levels, with the goal of improving European competitiveness, growth and employment). “Presenting a report under the name of the ERT seems to be the only way of getting the attention of the leaders of the EC (the European Community, as it then was). Time after time the ERT has succeeded in getting the EC to adopt the agenda of business at the expense of the environment, of labour and social concerns and of genuine democratic participation…..”. He is also Honorary President of the European Movement Ireland, a hotbed of Europhile stasis, the local outpost of an organisation once funded by the CIA. Sutherland keeps his hand in too, on crude globalisation. He is Honorary EU President of the Transatlantic Policy Network, which “is prepared to focus the efforts of its activities to ensure the success of this crucially important venture [Transatlantic Trade and Investment Partnership, TTIP]. According to Guardian journalist, George Monbiot: “The purpose of [TTIP] is to remove the regulatory differences between the US and European nations…It would grant big business [the right] to sue the living daylights out of governments which try to defend their citizens. It would allow a secretive panel of corporate lawyers to overrule the will of parliament and destroy our legal protections. The mechanism through which this is achieved is known as investor-state dispute settlement… It looks like the greatest international assault on democracy devised in the past two decades”. The German Magistrates’ Association, “sees neither a legal basis nor a need for such a court”. With his centrality to globalisation, with his impressive practice of red-toothed global capitalism at the oil-head and with his continuing fronting of organisations that promote all this, Sutherland might legitimately be apotheosised as the Messiah of universal capitalism. It would be nice to think he favours measures to mitigate the harsher effects of this harshest of dogmas, but the evidence is not there. Of course he is not in conventional terms an extremist, just a defender of the broad globalised capitalistic status quo. He told the FT: “If you look at Denmark as an economy, you have higher marginal rates of tax, lower unemployment, a very high safety net support, and GDP per capita significantly higher than this country’s. This is the social model everyone was moaning about. But maybe it works rather well. What you also have, agreed with the unions, is a flexible labour market. Labour market flexibility is to my mind very, very important – far more important than the ability to earn very large sums of money… I feel somewhat hypocritical because I’ve been a beneficiary of this” – and, the FT surmised, judging by the well-cut suits around him he was not the only one – “but I don’t think that has interfered with my thinking processes. I do think we need to reflect on a certain culture of excess”. was non-executive Chairman of Goldman Sachs International (a registered UK broker-dealer, a subsidiary of Goldman Sachs) until June 2015 after being associated with Goldman since 1990 when he joined the bank as an international adviser. Some estimates put his stake in the company as having been worth Stg£171m at the time of its flotation in 2003. After just seven years in the job he had reached the top 200 in the UK’s Rich List. To this day, Sutherland “continues to provide strategic advice to the firm on global business development opportunities as an international adviser”, according to an internal Goldman memo. Goldman won many contracts in Ireland during his time in Goldman Sachs International. It advised the Government on a debt-for-equity swap at Bank of Ireland, which reduced its debts by over €900m. It was also an adviser on the investment in the bank by a private syndicate led by high profile US investor Wilbur Ross. It most recently won the weirdly unpaid role of advising the government on the sale of nationalised bank AIB. It is weighing a bid for two massive bundles of Irish loans with a combined face value of €4.7bn being sold by the National Asset Management Agency (Nama). The firm has bought several large portfolios of Irish property loans from banks in recent years. Most of the deals were fronted by Beltany. During the global financial crisis Goldman Sachs misled its investors and profited from the collapse of the mortgage market ultimately ending up with a $550m settlement with the US SEC in 2010. More recently it was hit by a $5.1bn settlement to resolve allegations it mis-sold mortgage-backed bonds in the run-up the financial crisis. In the first half of 2009 Goldman received $12.9bn – more than any other firm – from AIG counterparty payments provided by the New York Federal Reserve bailout. It also received $10bn from the government (though the firm paid this back); all against the background of a record $11.4bn set aside for employee bonuses. Matt Taibbi, writing in Rolling Stone magazine, pictured the firm as a “great vampire squid” sucking money instead of blood, allegedly engineering “every major market manipulation since the Great Depression… from tech stocks to high gas prices”. He put it very concisely: “All that money that you’re losing, it’s going somewhere, and in both a literal and a figurative sense, Goldman Sachs is where it’s going”. The bank is a huge, highly sophisticated engine for converting the useful, deployed wealth of society into the least useful, most wasteful and insoluble substance on Earth — pure profit for rich individuals. They achieve this using the same playbook over and over again. The formula is relatively simple: Goldman positions itself in the middle of a speculative bubble, selling investments they know are crap. Then they hoover up vast sums from the middle and lower floors of society with the aid of a crippled and corrupt state that allows it to rewrite the rules in exchange for the relative pennies the bank throws at political patronage. “Finally, when it all goes bust, leaving millions of ordinary citizens broke and starving, they begin the entire process over again, riding in to rescue us all by lending us back our own money at interest, selling themselves as men above greed, just a bunch of really smart guys keeping the wheels greased. They’ve been pulling this same stunt over and over since the 1920s”. Goldman has also been accused of an assortment of other economic offences including insider trading and ramping up the prices of commodities through futures speculation. Most infamously in Europe, Goldman Sachs advised the Greek government which disguised the reality of its national debt between 1998 and 2009. Then in 2009, Goldman Sachs, among others, created a special credit default swap (CDS) index to cover the high risk of Greece’s national debt The interest rates of Greek national bonds surged, leaving Greece in effect bankrupt. Simon Johnson, a former International Monetary Fund economist, in his book ‘13 Bankers’, postulated that Goldman Sachs and the other large banks had become so close to government in the run-up to the financial crisis that the US was effectively an oligarchy. At least European politicians aren’t “bought and paid for” by corporations, as in the US, he said. “Instead what you have in Europe is a shared world-view among the policy elite and the bankers, a shared set of goals and mutual reinforcement of illusions”. Goldman specialises in the government/ bank turnstile. For example, former Goldman CEO Henry Paulson was the architect of the US bank bailout, a suspiciously self-serving plan to funnel trillions of public money to a handful of his old friends on Wall Street. Robert Rubin, Bill Clinton’s former Treasury secretary, spent 26 years at Goldman before becoming chairman of Citigroup — which in turn got a $300bn taxpayer bailout from Paulson as Treasury Secretary. For further example: Petros Christodoulou, Deputy Chief Executive Officer of the National Bank of Greece and former General Manager of the Public Debt Management Agency of Greece is a one-time Head of Money Markets Trading in Goldman Sachs London. Mario Monti, Italy’s former prime minister and finance minister, who fronted the new government that took over after charlatan Silvio Berlusconi’s resignation, was former managing director of Goldman Sachs International. Elevating a senior adviser at Goldman Sachs to the premiership of a Western nation gainsays the ostensible political toxicity of the greed-driven ophidian. Monti was not sympathetic, for example, to Greece. Mark Carney, Governor of the Bank of Canada 2008–13 and Governor of the Bank of England since July 2013 worked for Goldman for 13 years, including on South Africa’s post-apartheid venture into international bond markets, and the 1998 Russian financial crisis. These ties between Goldman Sachs and European leaders are an ongoing source of controversy and despair. From 1996 until 2009 Sutherland was non-executive chairman of BP Europe’s largest oil company. At one point during his tenure, the company was valued on the stock market at £236bn (it is currently worth about £120bn) and was making £42m a day in profits. While BP was no model of financial fair play or safety scrupulousness, it is for its environmental delinquency that it figures in this moral indictment (see 2A below). The indictment is that through self-interest he, Peter Sutherland, does promote the vested interests of unethical organisations that he fronts. Sutherland was the Chairman of Ireland’s biggest bank, AIB (Allied Irish Banks), from 1989 until 1993. In 2000 a €90m settlement was imposed on AIB with the Revenue Commissioners for Deposit Interest Retention Tax (DIRT) evasion. It remains the highest tax settlement in the history of Ireland. In 1991 the bank’s internal auditor, Tony Spollen, ironically Sutherland’s best schoolfriend, highlighted a possible DIRT liability of £100m for the years 1986 – 1991, but Gerry Scanlon, the group chief executive rubbished this estimate, which he disdained as “infantile”. The Oireachtas Sub-Committee Inquiry into DIRT in 1999 concluded that it was “extraordinary” for Scanlon to have told the Inquiry that he was unaware of the scale of the DIRT issue. In his autobiography, Desmond O’Malley claims that Sutherland, as chairman of AIB, threatened to sue him as minister for Industry and Commerce when a levy was proposed for the bailout of ICI Insurance company, a subsidiary of AIB which had actually been bailed out by the State in 1995. Sutherland was a director of the Royal Bank of Scotland Group until he was asked to leave the board when it had to be taken over by the UK government to avoid bankruptcy, in 2009. The Royal Bank of Scotland was bailed out by the British Government in what was partial nationalisation, to the tune of Stg £20bn. In Ireland Royal Bank of Scotland hiked up interest-rate payments, instituted widespread repossession proceedings, and ultimately fled this little country after selling its assets to vulture funds. It is also alleged that Sutherland unethically abused access to a national newspaper of reference afforded to him by his peers to promote the interests of banks, including the one he chaired, to the detriment of the public and the public interest. Writing in the Irish Times in September 2010 about the imminent Irish government budget for 2011, Sutherland said of a proposed €3bn cut in expenditure: “The figure of €3bn has been postulated as the improvement to be sought in the next budget”. “We are told that this is all that the political system can bear, but if all the mainstream political parties accept that more is required – although disagreeing perhaps about where to find the €3bn – and are prepared to say it, we can find a way”. Sutherland said a default on State debts would leave the Government without the capacity to manage its affairs or raise finance. “It simply is not an option to choose,” he said. He also warned there was “no way” the country could walk away from the cost of Anglo Irish Bank. He criticised repeated calls by the Financial Times – echoed by other commentators – for the Government to let the bank’s losses fall on the institution’s bondholders. The country’s running costs were “still far too high” and were way above the European average in the public sector. “We have to recognise that as currency devaluation is not an option, downward flexibility in wages and prices is essential to avoid unemployment”, he said. BP was directly involved in several major environmental and safety incidents during his tenure (1995-2009), though of course he was gone by the time of Deepwater Horizon, where a federal judge in New Orleans has granted final approval to an estimated $20bn settlement, resolving years of litigation over the 2010 BP oil spill in the Gulf of Mexico. A federal report issued in September 2011 concluded that BP’s efforts to reduce costs for the Macondo well contributed to the conditions that caused the blowout. Nevertheless the safety and environmental protection regimes which evolved during Sutherland’s time had not changed significantly by the time barrels of oil were poured into the Gulf of Mexico. During Sutherland’s actual office, BP was responsible for the 2005 Texas City Refinery explosion, which caused the death of 15 workers and resulted in a record-setting OSHA fine. To save money, major upgrades to the 1934 refinery had been postponed. BP’s CEO, Lord Browne, pledged to prevent another catastrophe but just three months later, ‘Thunder Horse PDQ’, BP’s giant new production platform in the Gulf of Mexico, nearly sank during a hurricane. In their rush to finish the $1bn platform, workers had installed a valve backwards, allowing the ballast tanks to flood. Inspections revealed other shoddy work. Repairs costing hundreds of millions would keep Thunder Horse out of commission for three years. Britain’s largest oil spill, the wreck of the Torrey Canyon, happened while Sutherland was chair, and the 2006 Prudhoe Bay oil spill. Sutherland leveraged his position in BP and his regard in Europe. In 2007 he served as official adviser on energy and climate change to the present Commission chief José Manuel Barroso. He claimed that he was counselling Barroso in a personal capacity. But it was difficult to see how he could disentangle himself from his complex web of business interests each time he spoke to a Brussels official. Around the same time Sutherland served as advisor on business and climate change to then Danish prime minister Anders Fogh Rasmussen. As chairman of BP, Sutherland served a company which strives to shape EU legislation in its favour. BP belongs to an alliance of energy giants known as the European Petroleum Industry Association (EUROPIA). This group was lobbying vigorously to ensure that all permits to refineries are awarded free-of-charge, contending that making them pay for the permits would damage the industry’s competitiveness. “In 2000 a federal judge imposed a $500,000 criminal fine on BP for failing to report the illegal disposal of hazardous waste on Alaska’s North Slope. The company was also ordered to establish a national environmental management system to prevent future violations. The total cost to the company from this and a related civil matter was said to be more than $20m. In 2002 BP was fined £1m by UK authorities for violating safety regulations in connection with several accidents at a refinery in Grangemouth, Scotland. In 2003 California’s South Coast Air Quality Management District filed an omnibus complaint against BP, seeking $319m in penalties for thousands of air pollution violations over an 8-year period at the company’s refinery in Carson. The agency later filed another suit against BP for $183 m. In 2005 the parties reached a settlement under which BP agreed to pay $25m in cash penalties and $6m in past emissions fees while spending $20m on environmental improvements at the refinery and $30m on community programmes focused on asthma diagnosis and treatment. In 2005 BP was accused of trying to cover up deficiencies in the anti-corrosion coating on the 1,000-mile-long Baku-Tbilisi-Ceyhan pipeline that carries oil from Azerbaijan to the Mediterranean. BP is the lead participant in the joint venture that operates the pipeline, the largest shareholder in the consortium that owns it, and the operator of the oil fields that supply it. Human rights activists criticised Western governments for the pipeline, due to reported human and civil rights abuses by the Aliyev regime. A Czech documentary film ‘Zdroj’ underscores these human rights abuses, such as eminent domain violations in appropriating land for the pipeline’s route, and criticism of the government leading to arrest. In March 2006 more than 250,000 gallons of crude oil spilled at BP’s Prudhoe Bay operations in the Alaskan tundra. Several month later, the company shut down the huge Prudhoe Bay oil field because of additional leakage caused by corrosion in the transit line that carried crude oil to the Trans-Alaska Pipeline. There were press reports that BP had been warned of the problem more than two years earlier. In May 2007 the House Energy Committee released documents suggesting that cost-cutting pressures weakened preventive maintenance and other safety practices in the period leading up to the leaks. Prudhoe Bay was the largest oil spill on Alaska’s North Slope, and resulted in a US$25m civil penalty – at the time the largest per-barrel penalty for an a spill. In 2005, 15 workers were killed and more than 170 injured in the Texas City Refinery explosion. In October 2007 BP agreed to pay a total of $60m in fines to the EPA. The amount included $50m for violations of the Clean Air Act in connection with the 2005 explosion at the Texas City, Texas refinery in which 15 workers were killed. The company also pleaded guilty to a felony violation of the act and was to serve three years of probation. Apart from the fine, BP agreed to spend $265m for a facility-wide study of its safety valves and a renovation of its flare system to prevent excess emissions. Later, in October 2010, BP agreed to pay $15m in Clean Air Act penalties in connection with violations at the Texas City refinery. At the same time, BP agreed to pay the EPA a $12m fine in connection with the March 2006 oil spill in Alaska, pleaded guilty to one misdemeanor violation of the Clean Water Act, and was ordered to serve three years probation on this offense as well. The company was also required to replace 16 miles of pipeline at a cost of $1.56bn. In 2008 BP and several other oil majors agreed to pay $422m to settle suits that had been brought by public water systems in 20 states and consolidated in federal court relating to the contamination of groundwater supplies by the carcinogenic gasoline additive, MTBE. At its annual meeting in 2010, BP faced a barrage of criticism over its involvement in controversial tar sands oil production in Canada”. In its official impact assessment, the EU Commission admitted that TTIP will generate a massive increase in imports of gas and oil from the US, including from tar sands, which are the dirtiest and most carbon-intensive of all fossil fuels. The recent leaking of TTIP negotiation documentation show that climate justice and environmental protection did not feature in negotiations at all. Both the “general exceptions” rule, enshrined in by the WTO, and the ‘precautionary principle’, are entirely absent from the negotiating texts. “Cap-and-trade is really just a carbon tax, structured so that private interests collect the revenues. Instead of simply imposing a fixed government levy on carbon pollution and forcing unclean energy producers to pay for the mess they make, cap-and-trade will allow a small tribe of greedy-as-hell Wall Street swine to turn yet another commodities market into a private tax collection scheme. This is worse than the bailout: It allows the bank to seize taxpayer money before it’s even collected”. “BP was one of about two dozen large corporations named as defendants in a lawsuit filed in U.S. federal court in 2002 that accused the companies of aiding and abetting crimes against humanity committed by the government of South Africa during the apartheid era. After surviving various challenges that went all the way to the US Supreme Court, the case continued and is pending. Groups such as the Kurdish Human Rights Project have criticized BP’s Baku-Tbilisi-Ceyhan pipeline not only for environmental reasons but also for human rights abuses reportedly perpetrated on opponents of the pipeline project in Turkey. In 2009 a group of Colombian farmers filed suit against BP in British court, alleging that the company’s pipeline in their country caused landslides and damage to soil and groundwater, thus harming their crops, livestock and fish ponds”. Sutherland recently fended off an attack of throat cancer and has been pouring himself into promoting immigration, a topical issue and one with an enormous ethical dimension. He recently told the Irish Independent’s Dearbhail McDonald that “I’m up to my gills in travel and dealing with the migration issue”. He has become a ubiquitous advocate for liberal immigration policies into the European Union. He is, however, mostly silent on the migration policies of other regions. “Europe faces an immigration predicament. Mainstream politicians, held hostage by xenophobic parties, adopt anti-immigrant rhetoric to win over a fearful public, while the foreignborn are increasingly marginalized in schools, cities and at the workplace. Yet, despite high unemployment across much of the Continent, too many employers lack the workers they need. Engineers, doctors and nurses are in short supply; so, too, are farmhands and health aides. And Europe can never have enough entrepreneurs, whose ideas drive economies and create jobs”. There is concern his agenda remains globalisation but that he masks it as internationalisation with dollops of anti-racism, benevolence and philanthropy. “Migration is the defining issue of 21st century”, he says. This should make for a stirring call to arms, yet somehow never quite does. Sutherland says that as Irish people, “we should seek a society and identity defined by its values, not by its sense of nationality. We have had enough tribalism on this island”. His ultimate goal is described by McDonald as simple but uplifting: “How to live well, together… My life’s work all stems from a single stream of belief in integrating people, in the dignity and quality of the human person. That’s what’s drives me, that’s why I love what I’m doing. I can’t even think about retirement”. As if at the end of his career he’d never heard of competition, capitalism, inequality. Moreover the effects of liberalisation of immigration are entirely compatible with, indeed necessary for, the flourishing of unmitigated global capitalism. In addition to the philanthropic imperative, liberal immigration increases competition, lowers wages and disrupts communities in both host and former homelands. “Angela Merkel has associated the morality of the migrant issue with trying to hold Europe together at a time when it is in danger of breaking,” he says. “It’s exactly how I feel”. In an Irish Times interview last year Sutherland said he despaired of Britain’s deteriorating migration debate but reserved special odium for Hungary, Poland and Slovakia. “Their restrictive line on asylum seekers threatens the Schengen principles of free movement of people, he said, and was a “body blow to European integration”. The obsession was with integration, not human rights. Sutherland is clearly alive to the moral dimension of his career. He told the Irish Times of his education by the Jesuits: “We were expected to lead in society if we could”. He can be testy if the ethics of the organisations he has fronted is queried: “That’s typical of the Irish, to sneer”. Sutherland resides in Knightsbridge (and occasionally Donnybrook) perhaps, like Charles Foster Kane in Xanadu, surveying a life of remarkable achievement. World-straddling – a bit like the obverse of the internationally cherished, endlessly-good-doing, Lord Attenborough. The scandals of our age, ladies and gentlemen of the moral jury, are inequality and environmental degradation. In Peter Sutherland we have the ultimate insider, the face of GATT, of the WTO and of the vampire squid, Goldman; of BP, AIB and Bilderberg. Internationalist, proselytiser for competition and austerity, immigration ambassador, Vatican Man, renaissance man, occasional philanthropist, Irishman, Man of his Time. Consider your verdict.